This 1100-ton link-motion press at Stanco in Santa Teresa, NM, draws and forms parts requiring 6-in.-plus draws and up to 60-in. wide coils through multiple progressions. Stanco Metal Products, Inc., which passed its 100-year milestone last year, isn’t taking its foot off the gas. Instead, it continues adding workers and equipment to produce myriad parts for appliances, automotive, electrical, HVAC, lawn and garden, lighting, office furniture, and solar sectors. Not bad for a company that started by making knitting needles, crochet hooks and thread retainers long before it became a metal fabricator during World War II when it produced precision aircraft parts. “The company, started in 1917 by my wife’s grandfather, Warren Stansberry Jr., was known as the Peerless Novelty Company until 1977. That’s when it became Stanco Metal Products,” recalls CEO Gerald Slagel, who heads the company from its operations in Grand Haven, MI, where it produces metal office furniture and automotive parts. His sons Jerry Jr. and Ben represent Stanco’s fourth generation and serve as general managers of the Santa Teresa, NM, and Williamston, SC, operations, respectively. Jerry Jr. looks after production of parts for appliances, HVAC, lawn and garden, and solar, while brother Ben oversees appliance, HVAC and automotive production. Lighting housings are shown being run on a progressive die. 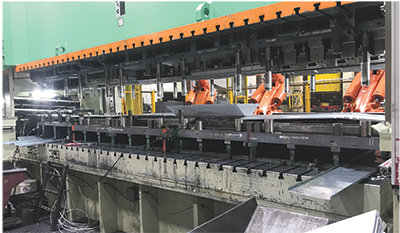 That brings us to Stanco’s decision to install the Seyi-America SEL2-1100 at its New Mexico factory, where extra-deep-draw-quality (EDDQ) cold-rolled-steel stampings requiring 6-in.-plus draws and up to 60-in. wide coils are produced through multiple progressions. Before adding the link-motion press in late 2016, Jerry Jr. says the parts were produced on a tandem line consisting of a 500-ton hydraulic press for drawing and a 600-ton mechanical press for finishing the last three stations of the part. 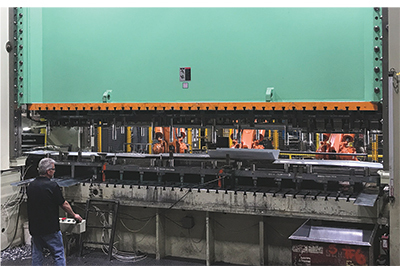 While link-motion technology does not possess the extreme capabilities of servo presses, which can be programmed at different speeds in the slide stroke throughout the cycle, the link-motion technology “fills the gap between servo and traditional mechanical presses,” says Scott Braito, director of sales at Seyi-America. While there is a cost differential “that varies, depending on the size of the press,” payback due to increased production—as much as 30 percent—can be less than a year, says Braito. Stanco’s Jeff McMillin is shown operating the Seyi SEL2-1100. Jerry Jr. agrees. “Our productivity and throughput are up, and we’re adding more work,” he says. This includes industrial parts for an OEM and reflector housings for the lighting industry—not so much due to the link motion, but due to the size of the press bed, which is 236 by 72 in. 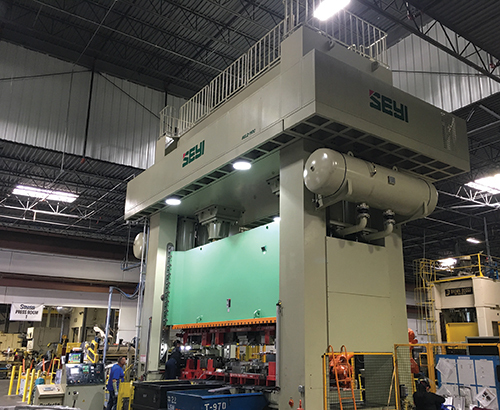 While Stanco’s New Mexico operations continue to grow and add new business, Gerald Slagel says that the South Carolina plant is preparing for new arrivals as well: a Seyi SAG-660 660-ton straight-side press capable of running at 40 strokes/min. and an SEL-2 1100, the same press that’s operating in New Mexico. “We’re seeing new business in South Carolina from the appliance and automotive segments, and while it’s difficult to project the payback on these presses, which are scheduled for installation May (SAG-660) and October (SEL2-1100), there’s definitely a need for additional equipment there at the plant,” he says.